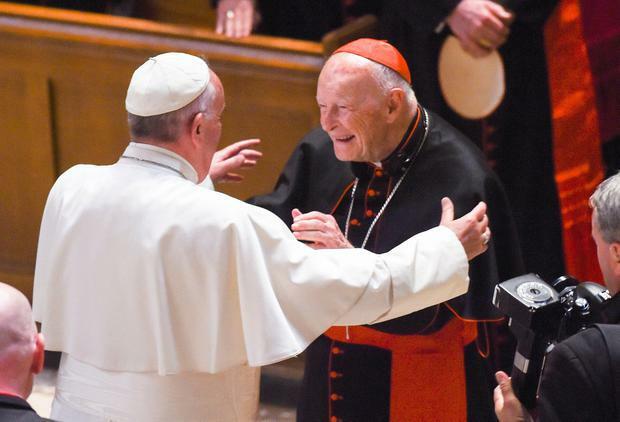 When Theodore McCarrick was defrocked on Saturday, becoming the first cardinal ever removed from the priesthood due to sexual abuse, he lost his right to the support he has enjoyed his entire adult life – housing and income provided by the Catholic Church. But McCarrick, who is 88 and has been living in a secluded friary in Victoria, Kansas, for several months while the Vatican considered the case against him, will be allowed to stay at the friary until his permanent housing is finalised, church officials have said. “There’s got to be basic sustenance. You can’t turn an almost-89-year-old out on the street,” said Susan Gibbs, who served as McCarrick’s spokeswoman when he was Archbishop of Washington. She noted that the decision is now in part McCarrick’s own; for the first time since he entered the seminary and then served 60 years as a priest and bishop, he is not bound to go where the Church tells him to go. “Technically he could walk out the door right now. In the Church, you make a promise of obedience,” she said. Laicisation, the most serious penalty the Vatican can hand down for a priest who has done wrong, removes a person from the priesthood permanently. McCarrick is no longer allowed to wear clerical garb or to perform priestly sacraments such as Mass. Several people connected to the Church declined to answer questions about McCarrick’s source of income. He was not required to take a vow of poverty in his prior priestly roles, and he might have independent savings to support himself. Cardinal Donald Wuerl, who was Archbishop of Washington until he retired in October in connection with his own oversight of abusive priests, took on the task of finding housing for McCarrick last autumn, while McCarrick was awaiting his Vatican trial. Pope Francis has not yet appointed an archbishop to replace Cardinal Wuerl, so Ms Gibbs said the Church might wait to remove McCarrick from the Kansas friary until a new archbishop is in place to deal with the task. Bishop of Salina diocese Gerald Vincke, who now says McCarrick can stay for the time being in the friary, was initially surprised when he got the call from Cardinal Wuerl asking him to take the disgraced ex-cardinal into his remote Kansas diocese. “I had to reconcile my resentment and disappointment,” he said at the time. Since then, McCarrick has lived quietly in the friary. The Reverend John Schmeidler, the priest in charge of the facility, said that he eats meals and prays with the elderly brothers. Rev Scheidler said McCarrick does not leave the friary, which is adjacent to the Basilica of St Fidelis, known as the Cathedral of the Plains. Peggy Fitzpatrick, a member of the pastoral council for the parish, said she was stunned to learn the disgraced ex-cardinal she had heard about was living in her town. “All of a sudden, boom. Father told us about it after he was already here,” she said. “It’s a block from the elementary school. That had a lot of people worried,” she said. That’s how Bill Robben, another local pastoral council member, feels about it. “To me, it’s not a problem. No qualms about it. I’m kind of a Christian guy. I’m not perfect. Nobody’s perfect,” he said.